Join us for wine and light refreshments as we network and share ideas with fellow artists, educators, and members of the community in an open and casual setting. Bring a friend, colleague, or anyone else interested in the field of art or education who would like to join the discussion and connect with peers! Our spring ArtistConnect welcomes attendees to celebrate Earth Day by presenting work around environmental issues and solutions. Can the emotional power of music help to motivate action on one of the biggest threats facing humanity? 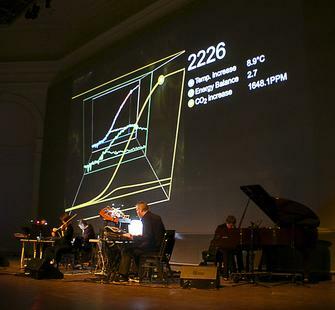 That’s what The ClimateMusic Project (ClimateMusic.org) is betting on as it creates science-guided music that viscerally communicates the urgency of the climate crisis. In his talk, What do we want the future to sound like?, the Project’s Founder and Executive Producer, Stephan Crawford, will recount how this unique collaborative spanning the sciences, arts, and technology came to be, and how its “hearts and minds” approach works to convert new emotional awareness in audiences into intellectual insight and a motivation to act. He’ll also share video clips of current works and will provide a glimpse of what the Project still has under wraps. Michele Guieu is a French-American environmental artist and art educator based in the Bay Area. Her practice focuses on sustainability and the consequences of human activity on the natural world, especially our watershed and the ocean. After her presentation on environmental art, Michele will offer attendees the opportunity to create their own “Be a Bay Hero Mini Mobiles” to keep you thinking about the bay and the important role each of us need to play to protect it.